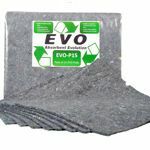 The new EVO natural fibre pads are made from a unique blend of 85% recycled natural fibres. 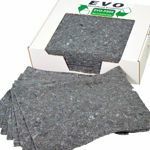 Obtained from sustainable sources and manufactured by a patented process here in the UK, this eco-friendly absorbent pad will have the lowest carbon footprint of any absorbent pad, or roll, currently available in Europe. The pads have a super high loft for superior sorbency performance but also have a tough, yet soft, construction for maximum usability. 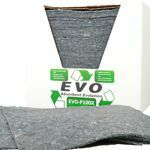 Due to the fibres used in their manufacture the pads have the lowest dust of any natural product currently sold in Europe and have a low linting construction which enables them to be used as a bench-top pad. The fire resistant fibre blend will not burn , even when exposed to a naked flame. 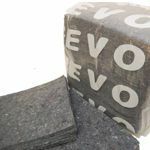 The unique blend of fibres used to make the pad enables them to be oil and hydrocarbon preferential. This means that whilst the pads will absorb water based fluids, they will only do this after a prolonged period. 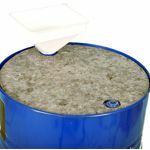 They will float on water and will wick oil from the surface similar to melt-blown pads, which are the most used at present. 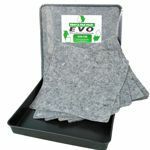 The consistent quality maintained during the patented manufacturing process enable the end user to use an eco-absorbent pad with confidence.